Your browser does not support the video tag. Ingredients 2 cups (200g) of elbow macaroni ¼ cup (62g) of Lactantia® Lactose Free Butter, Salted ¼ cup (32g) of all-purpose flour ½ tsp (3g) salt Ground pepper, to taste 2 cups (500mL) of Lactantia® Lactose Free 2% Milk 2 cups (250g) of shredded Black Diamond® Lactose Free Marble or Old Cheddar Instructions Bring a large pot of lightly salted water to a boil. Cook elbow macaroni in the boiling water, stirring occasionally until cooked through but firm to the bite, 8 minutes. Drain. Shred Black Diamond® Lactose Free cheese. 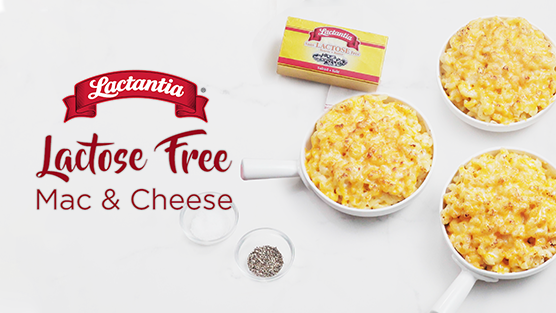 Melt Lactantia® Lactose Free butter in a saucepan over medium heat; stir in flour, salt, and pepper until smooth, about 5 minutes. Slowly pour Lactantia® Lactose Free milk into butter-flour mixture while continuously stirring until mixture is smooth and bubbling, about 5 minutes. Add Black Diamond® Lactose Free cheese to milk mixture and stir until cheese is melted, 2 to 4 minutes. Fold macaroni into cheese sauce until coated. Transfer to baking dish and sprinkle with cheese. Bake at 325° F (160° C) until crispy! Shred Black Diamond® Lactose Free cheese. Melt Lactantia® Lactose Free butter in a saucepan over medium heat; stir in flour, salt, and pepper until smooth, about 5 minutes. Slowly pour Lactantia® Lactose Free milk into butter-flour mixture while continuously stirring until mixture is smooth and bubbling, about 5 minutes. Add Black Diamond® Lactose Free cheese to milk mixture and stir until cheese is melted, 2 to 4 minutes. Fold macaroni into cheese sauce until coated. Transfer to baking dish and sprinkle with cheese. Bake at 325° F (160° C) until crispy!